Audiolith Webshop: audiolith.net/shop/stiff-little-spinners Decks.de: bit.ly/1pgiGEU Deejay.de: bit.ly/1tYGX8Q iTunes: bit.ly/StiffLittleSpinners5 Dates: 21.11. Dresden - Paula 22.11. Berlin - Rosis Stiff Little Spinners. Volume 5. 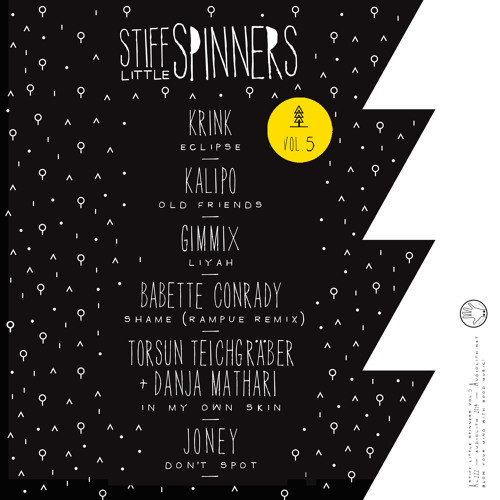 The Stiff Little Spinners are back on a solo tip with the fifth edition of our vinyl series that's embracing the world of electronic dance clubs and open air raves with heartfelt warmth, organic basslines and a whole lotta love. After releasing Volume 4 alongside our tenth anniversary compilation „Audiolith -Ten Years From Now“ Stiff Little Spinners Volume 5 once again serves a fine, hand-picked selection of six melodious club essentials somewhat in between Tech- , Romantic- and DeepHouse-grooves for intimate late night jams and cosy venues crowded with musical connaisseurs. Starting things with the man they call Krink @krink, our Stiff Little Spinner number one, multi-active produce and master of melodies, we see a pumping „Eclipse“ hyping crowds with its on-point pounding bassdrums and an ever spiralling synth line that reaches new heights on top of huge organic basslines and yearning, masterfully crafted strings that'll take every TechHouse-infused set to the next level from the very first drop onwards. Coming up next is another of our „Old Friends“ - Kalipo @kalipo-1. Whilst exploring further realms of a universe build on a solid foundation of analogue synth structures and tender echoes of processed vocal bits the Berlin-based producer speeds up things here and tops his excellent primetime cut with lively shakers and a killer break introducing nothing but peace, love and overwhelming beauty. Another well-established member of the Stiff Little Spinners crew is Gimmix @djgimmix who's catering his tune „Lyah“ here – a sweet fusion track amalgamating elements of vocal driven deepness with fascinating Future Garage / SpeedGarage bassrides that are providing maximum pressure on every proper rig. Add up a few Jungle-referencing sample cuts and melancholia driven motor city string arrangements to this mixture and you'll find a perfect combination of elements that is never about to leave any real DJs crates. Instant classic. Remixed by Rampue @rampue we see Bebetta Conrady's „Shame“ weigh in epic modulations, sweet uplifting vocals, tribalistic drums and candy-coated piano lines that fall together perfectly, building a unique electronic love song of a kind that's translating the universal language of love into a stream of sonic pulses about to trigger all punters hearts for a reason. More beats, tenderness and pure dancefloor pleasure are provided by the pairing of Torsun Teichgräber @torsunteichgraeber and Danja Mathari with their collaboration effort „In My Own Skin“. Together they're riding the Piano wave on top of slightly distorted yet seductive analogue synth modulations rocketing off into Rave heavens whilst the fragile, cuddly and super-cute vocals turn this tune into an unforgettable love affair that's meant to last forever.. Finally rounding of this little story with a bass heavy fusion of UK Funky, Future Garage and rumbling TechHouse is Hamburg's ILLest producer Joney @joney who's bringing on a lively swing, athmospheric strings and echoing female vocals bits with his tune “Don't Stop” - an ultimate crossover piece that's calling out for a reload or two.